Installation of these vibration insulation rubber foam pads requires no bolting, and every pad is free of halogens, formaldehydes, CFCs, HCFCs and sulfurs. The pads are fully recyclable and will not emit harmful toxins if burned. Choose from 4” x 4” or 18” x 18” pads, each with 1” thickness and sold in varying sets. For safe, effective noise and vibration reduction with a cutting-edge product, TriCore is reliable and quality-made. Shop today or contact us with questions! TriCore Rubber Foam Pads isolate vibration from compressors, generators, pool pumps, A/C units, and a variety of other machinery or equipment. Install TriCore Rubber Foam Pads under the noise source to reduce the vibration transmission. TriCore Rubber Foam Pad, 1" x 18" x 18", isolate vibration from compressors, generators, pool pumps, A/C units, and a variety of other machinery or equipment. Install TriCore Rubber Foam Pads under the noise source to reduce the vibration transmission. 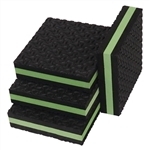 TriCore Rubber Foam Pad, Green Series Case, 12 per case, 1" x 18" x 18"
TriCore Rubber Foam Pad Case, 1" x 18" x 18", 12 per case, isolate vibration from compressors, generators, pool pumps, A/C units, and a variety of other machinery or equipment. Install TriCore Rubber Foam Pads under the noise source to reduce the vibration transmission.